Bloodborne is a tough game, right? Merciless environments, tricky enemies, and some of the most memorably dangerous boss fights on the PlayStation 4. But what if you could make every single boss forget that they're supposed to be killing you? Seemingly, the latest bug discovered in From Software's latest Sony exclusive does just that. Explained in-depth throughout this Reddit thread, it's stated that if the PS4 console is left running the release for extended periods of time (upwards of twelve hours, at an estimate), memory issues will cause bosses to completely avoid using the majority of their abilities, opting instead for offensives that could easily be stamped out by a toddler. "Blood-Starved Beast stops jumping all over the room and doing multi-hit combos and just politely spams his side-swipe, Amelia stops healing, One Reborn stops pooping acid – every boss changes in some way and ultimately becomes much easier," states user Meatballz, providing video proof of a late game boss fight to help substantiate their claims. Dozens of additional users pitched in with their experiences, the majority claiming to have experienced similar issues after leaving their consoles running for too long. The moral of the story? Let your PlayStation cool down every now and then, or experience the most disappointing edition of Bloodborne on easy. @SuperSilverback I actually find that you'll pretty much always end up more or less where you need to be. There are a few exceptions, but the game's quite linear — they do a great job of 'disguising' it. @get2sammyb That area is completely missable; you can easily beat the game the game without ever seeing it. I think I must have missed about 30 to 40 percent of the game when I beat the game... You won't find it just wandering about. It has a prerequisite that starts at the Forgotten Forest and ends at Iosefka's Clinic. Everything in the game except for maybe some of the Nightmare is connected. I'd hardly call that linear. @SuperSilverback That is the Cainhurst area. It is only accessible by obtaining the Cainhurst Summons key item located beyond the closed door at the top of the steps in the 1st Floor Sickroom. The door only opens from the opposite side, and in order to open it you must first a cave filled with poisonous liquid and also inhabited by giants and carnivorous worms. It can be pretty stressful and is easily missed especially if you find it, die, and then tell yourself you'll come back to it. You could easily forget about it with all of the other things to do in the game. It's definitely worth doing to get the Chikage though. Good luck! I defeated Amelia pretty easily & I know I've had my console on for long periods of time as I have been enjoying long sessions on Bloodbourne. I remember my battle with the blood starved beast was quite tough but when I fought Amelia, in hindsight she seemed pretty useless. I had presumed I'd maybe stunned her & exploited her weakness, I had no intention of trying to use glitches etc. I'm aware of people using glitches to defeat Father Gasgoigne & also the Hunter in the graveyard, but I refuse to use these, even when I'm struggling as I feel that defeats the object of the game. I hope this gets patched asap, it seems this game could have benefited from another month or two in Q & A testing. Wonder if that's why cleric beast was so easy for me. I just attributed it to the fact I didn't run into him till after father g and spending pretty close to 10hrs leveling, grinding, and repeating until everything in the starter area was a 3 hit maximum. But the beast jumped a few times, got a good couple shots in, and otherwise was spank, tank, and roll to his backside. The bosses are brutal...I only beat the cleric beast because I summoned help and the Hunter guy has kicked me all over 4 times now and I've yet to beat him...however Id still rather not use a trick/glitch/cheat like that. I don't mind dying, other than the load times, because I love the setting and how the game looks....I've not enjoyed sight seeing in a games realm so much since Dishonoured. Admittedly in Dishounered I was a teleporting murder God...not the chew toy of unholy beasts from the unfathomed depths of hell. It will take me a while but I'll beat the game as intended. @Constable_What aha i think ive found that cave! @Constable_What I wasn't criticising the game at all — I love it — but thanks for the correction. All I was saying was that if you wander about you usually end up where you're supposed to be, which I think is generally true. I wouldnt be surprised if this is somewhat intentional. I mean, who has their PS4 running 12 straight in one game? If its taking that long to beat a boss, youre clearly getting wrecked so it may be a way of evening the odds. Like the old controller in port 2 on MGS. I'll just post this here for obvious reasons: I've had it with this website. 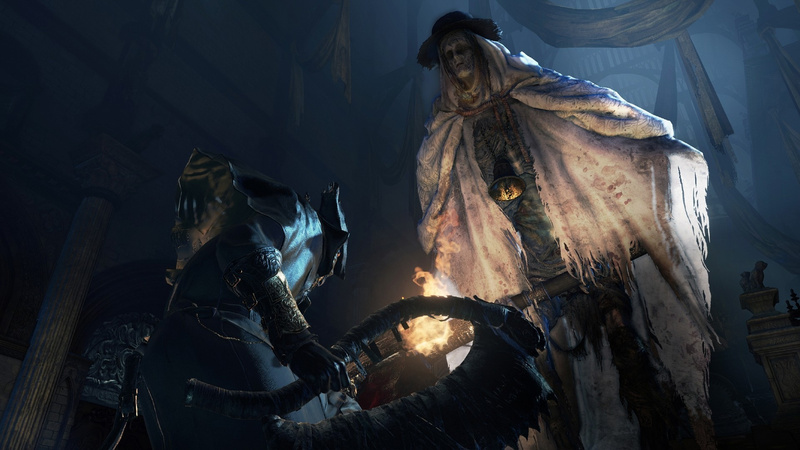 STOP SPOILING BLOODBORNE. damn, are you guys assholes or just plain stupid?